The need to lengthen the dress can appear in different situations. For example, recently bought new dress was provocatively short, the thing the village after washing, or its owner has grown a few inches. If you use the advice of experienced seamstresses, to independently change the length of the dress will be easy. - do not deteriorate the appearance of the model after enlargement. When a solution is found, it should be to dream a little and to prepare everything necessary for the alteration: measuring tape, ruler, scissors, sewing machine, small pieces of fabric or finishing materials. If you need to extend the product a few inches, you should turn it wrong side and inspect the seams. The dress, the hem of which is filed 3-4 cm, it is possible to unpick the hem and carefully ironed it. Then you should try the dress on to make sure that the resulting length of the product corresponds to the desired. The lower section of the hem of the summer dress can be turned over with bias binding in a contrasting color or handle braid. To the bottom of dresses made of thick fabric, you should sew a strip with a width of 4-5 cm from a fabric of suitable colour, to bend it on the wrong side and hem with hidden stitches. In models with cross seams, such as chest, waist or hips, a desired elongation can be achieved by reducing the width of the seams. For this you need to lay a new line at a distance of 0.5 cm from the edge parts, and the old line to strut. After that, the seams should be ironed. This method allows you to lengthen the dress by 1-1. 5 cm due to each weld. If the dress needs to be lengthened by more than 4-5 cm have to make changes in its structure. The easiest option, which is suitable for dresses above-knee length to sew the hem wide lace or some decorative multi-colored strips of fabric matching colors. 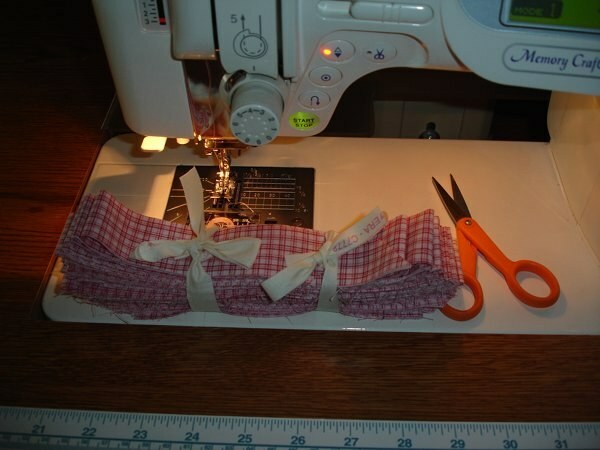 You can sew the hem of the dress 1 flounce or ruffles 2 different widths. This will update the appearance of the product, make it more fashionable and interesting. To make the extension look more harmonious, the model should be supplemented by a few details from the same material, for example, a lace bow or belt of fabric used for the elongation of the product. Looks interesting dress, elongated transparent inserts. It's enough to cut the skirt into several parts. Thus the line of the cut should go parallel to the line of the bottom of the product and be at a distance of 12-15 cm from each other. To the resulting parts of the split skirt wide lace or strip of transparent or fishnet fabric. As a result, the updated dress will be more romantic and soft look.